From here onwards, you will see the exploration of Sage Drachen. The sage is my newest incarnation and will be in Britannia to explore, research, and boldly go where no Britannians has gone before *winks*. Here he went to the Maze. He has no magery and therefore the journey is exhausting (no way to teleport) but finally (lagging all the way) i reach this place.. a small structure with spider carvings. I called it Spider Shrine. The sgae finally reached the center of the maze unharm! and now he pass the secret tunnel into the cellar of a building. 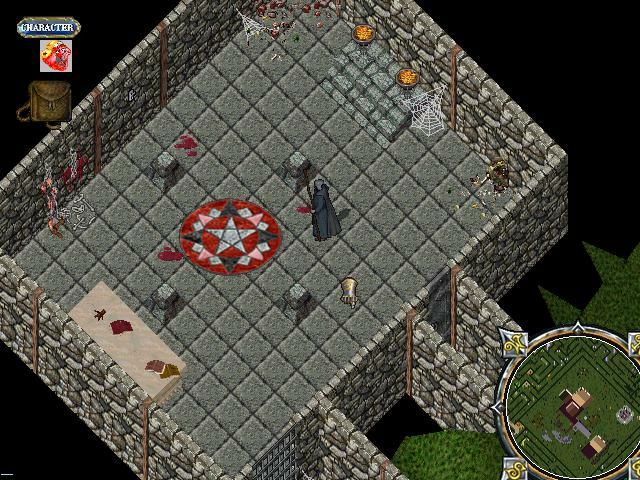 Here you can see a pentagram, which i believe Relvinian use for summoning purpose. There is also a switch on the left wall. I tried it, but there is no effect, hmmm. Here is the scene of the house on the right. I have looked around and there is nothing to be found here. The selves are useless and cannot be searched. Going upstairs will bring you to a room which has a teleporter. Step in to bring yourself to the small tower a little north of the building. As i have mentioned, this is the tower once you step into the teleporter in the second floor of the previous building. After climbing a few stairs, i reached the roof of the tower. You know i like it here, and maybe i will move in too (just hope no monsters come and eat me hehe). There is a second teleporter as you can see in the picture, a shimmering light. This will lead to the spot just outside the tower.